Hello and welcome on our blog! We are Bina and Francis and we travel with a Phantom around the world. On our website you can find the best tips for travelling with a copter! Join our journey! In this post, we have compiled for you the drone laws in Belarus. The regulation of multicopters is fairly simple in Belarus. We have compiled the conditions for drone pilots in Belarus here. 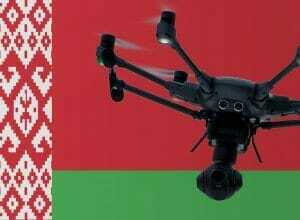 Maximum flight altitude: In Belarus, drones can ascend up to a height of 100 meters. Maximum horizontal distance and FPV: For safety reasons, you should always be able to see your Copter with the naked eye. Compulsory insurance: I strongly recommend that you complete a drone insurance valid in Belarus. Maximum take-off weight (MTOW): From a take-off weight of 500 grams, a marking of the multicopter is necessary. On the drone badge, the full name and address of the keeper must be noted. Distance to airports: We do not have any information yet. Other safe distances: We do not have any information yet. Flight bans: A decree refers to areas in which you can not fly with a copter. These no-fly zones should be specified by the Ministry of Defense. Basically, you should stay away from airports, military facilities, government buildings, power plants, prisons, courts, etc. You can see no-fly zones for drones on this map. Flight approval: We do not have any information yet. Time of operations: We do not have any information yet. Regulations for commercial pilots: The same laws apply to private and commercial drone pilots in Belarus. We have researched the listed drone regulations for Belarus to the best of our knowledge. We can not guarantee the correctness of the information. If you want to be on the safe side, please contact the competent aviation authority. Alternatively, you can also ask the embassy in your country for further information about the regulations. Please leave us a comment when you receive news and/or gain experience with your copter in Belarus! Since January 2015, we travel around the world. In our backpack we carry a camera drone which we use to capture the best places from a bird’s perspective. First we travelled with a DJI Phantom 2. But now we use a Yuneec Typhoon H. On our blog we share the best tips for you about travelling with a copter. If you have questions about this article or new information, don’t hesitate to leave us a comment! Thank you very much for the information on your blog. Oh perfect, thank you for the link! Copyright © 2019 Drone Traveller.